This newsletter contains information about two concerts this time, because in addition to the Havant Chamber Orchestra main concert at Ferneham Hall on 11th February, the HCO strings will be performing in an additional concert in the new Emsworth Baptist Church on 11th March (see the back page for details). This will give us a chance to try out the acoustics of the new church building, to gauge the level of interest in orchestral music in the area, and to make the Havant Orchestras known to a wider audience. This concert is one of the development activities being subsidised from the recent legacy from Margaret (and Tony) Packe, who lived nearby in Emsworth, and we are very grateful for the opportunity that this has provided. We will also be back in Emsworth in April. A group of players from Havant Chamber Orchestra (led by Cathy Mathews, with your chairman at the keyboard) has been invited by the Mayor of Havant to perform at St James’ Church on Sunday April 9th as the final concert of Havant Music Festival. The programme will consist mainly of baroque string music including several concertos (as for recent concerts performed by the same group in Droxford and Havant), and more details will be provided in the next newsletter. 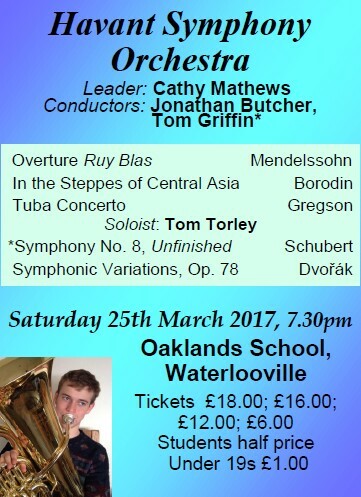 In the mean time, we have an exciting concert in Fareham, with a delightful but often overlooked Mendelssohn overture, the lyrical oboe concerto by Richard Strauss and the amazing exhilaration of Mozart’s final symphony. We hope to see you all there! 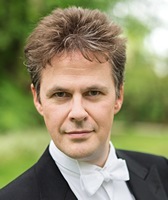 Richard Moore will be talking about Richard Strauss and his oboe concerto. The pre-concert interlude in the Octagon Lounge will be given by Meoncross Chamber Choir and Music Scholars, directed by Paula Barnes (HSO bassoon). These talented youngsters enjoy the opportunity to perform to an audience, so please move into the Octagon lounge in good time and encourage others to join you. Feel free to move around quietly, but to allow everyone to enjoy the music please keep any conversation low or move well away into the bar area or foyer. Hello and a very happy new year to you all. It seems to be only weeks since the last time I wrote that – time flies! I’m hugely looking forward to the next few months with HCO not least because we’ve managed to get two, not just one, concert into the opening months of 2017. And they’re both crackers. 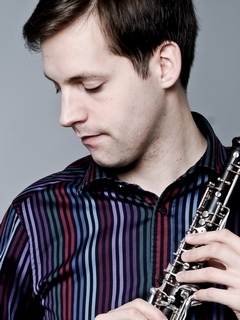 The Strauss Oboe Concerto is not only the greatest for the instrument, but one of the greatest 20th century concertos. A late work, it inhabits the same world as the Four Last Songs: subtle, harmonically-daring but with a definite backward glance at the classical world, and beautifully melancholic. Our soloist, James Turnbull, is an old friend and colleague – a stunning soloist who’ll be more than equal to its technical and emotional demands. Mozart’s Jupiter is one of those towering edifices for any conductor – a bit like Eroica, although shorter. It’s dense, full of wit and sparkle, yet is a masterwork of conception and craftsmanship. There’s not one note one could add, nor remove. I can’t wait to tackle it with these marvellous players. 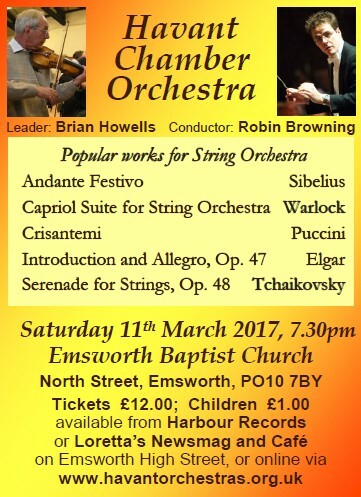 And, coming in March, the strings of HCO debut at Emsworth Baptist Church. There’s so much incredible repertoire to plunder for a string orchestra that it was more a matter of what to leave out than vice versa. But we’ve devised a fascinating programme of string gems, centered around the Elgar Introduction and Allegro for solo quartet and orchestra, and Tchaikovsky’s stunning Serenade for Strings. Plus there’s a little known wonder, Puccini’s Crisantemi, and works by Sibelius and Warlock. So much great music to love – I look forward to welcoming you to both of these concerts. (c/w Serenade Op.7 & Suite Op.4). (c/w Karelia Suite, The Oceanides, Luonnatar, King Christian 11 Suite, & Finlandia). (c/w string works by Britten, Delius, Holst, & Vaughan Williams). (c/w Messa di Gloria & Preludio Sinfonico). (c/w string works by Delius, Howard Goodall, Ireland, William Lloyd Webber, & Vaughan Williams). Schumann: Symphony No. 3 ‘Rhenish’.